Businesses face potential risks and cleaning challenges on a daily basis with fugitive dust in their facility. DeMarco will provide an ideal safe cleaning solution to meet your specific requirements. 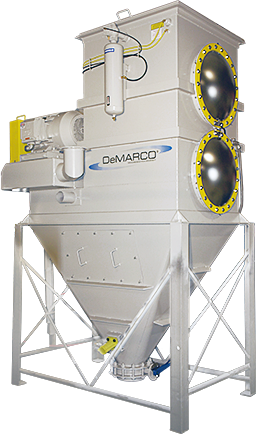 DeMarco manufactures the largest assortment of standard and custom material pre-separators. Select from portable roll-dump hopper, stand alone, trailer and skid mounted, or 55-gallon lid separator designs. The DeMarco Cyclone Pre-Separators allow the vacuum to receive minimal and, in some cases, no carryover while maintaining optimal industrial vacuum performance. Models are available in various containment sizes from 17-gallon to multi-cubic yard collectors. Portable DeMarco Vacuum Systems are compact and are built for ultra heavy-duty use inside or outside your facility. Efficiently collect any material with a DeMarco Industrial Vacuum ranging from 15 HP to 250 HP. Easily handles the heaviest, most abrasive materials to the finest of powders, without interruption. Stationary DeMarco Bottom-Dump Hopper Vacuums are built for ultra heavy-duty use inside or outside your facility. This design allows for batch or continuous dumping while maintaining hands-free filter cleaning for 24/7 operation. Efficiently collect any material with a DeMarco Industrial Vacuum ranging from 15 HP to 250 HP. Easily handles the heaviest, most abrasive materials to the finest of powders, without interruption.